Thank you for your interest in giving to the parks. Along with many volunteer opportunities, residents and visitors alike can support the parks by donating a table or bench, or by giving to the Nature Center Endowment Fund. The Ottawa County Parks Foundation, formed in 2016, raises funds to assist the Ottawa County Parks and Recreation Commission in achieving goals for acquiring land, developing parks and providing parks and recreation services to residents and visitors of Ottawa County. A bench or table is a wonderful way to honor the memory of a loved one, recognize a special person or give a unique gift to the person who has everything. 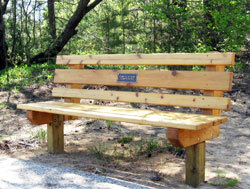 For a donation of $750 to $1500, Ottawa County Parks will install a bench or table adorned with an inscribed plaque. Contact the parks office at 616-738-4810 for more information. With school budgets more prudent than ever, many children may not get to experience the joy and wonderment of a field trip to Ottawa County’s Nature Center without your donation. Schools needing financial support for a field trip can request grants from the Nature Center Endowment Fund to help with expenses. Donations to the fund are also used to purchase educational supplies for the free nature programs offered at the center. 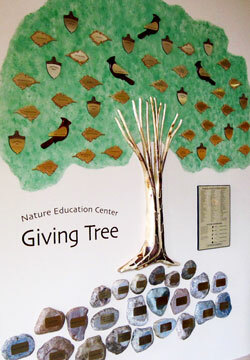 Those who donate $500 or more will be acknowledged, if desired, on a Giving Tree displayed prominently inside the Nature Center. You may donate to the Nature Center Endowment Fund by mail or online via credit card. To make a donation, please follow the directions below. If you have any questions, please call the Parks Office at 616-738-4810. We thank you from the bottom of our hearts! To donate a check by mail, download and print the donation form. Follow directions on the form. To donate online with a credit card, you will be linked to the web site of either the Grand Haven Area Community Foundation or the Community Foundation of the Holland/Zeeland Area. Carefully read the directions below, then click on the community foundation of your choice. There is a minimum donation of $25. On the home page, select "click here to donate." On one of the first pages, you will be asked to select a fund. Under specific fund, enter Nature Center Endowment, then follow the online directions to make a donation. There is no minimum donation. On the home page, select "Donate." After you enter the amount of your donation, select the "Update Total" button then follow the online directions. Before you select "Donate Now", be sure to select "Name of Fund" and enter Nature Center Endowment.